I am very pleased to announce the release of Paremus Nimble today. Nimble combines a feature rich OSGi shell with the industries most powerful dependency resolver. The Nimble release is not only a software release, but a landmark in our ongoing mission to making adaptive OSGi based systems simpler to develop and manage than the legacy they replace. The most productive way to manage and interact with OSGi Frameworks that's currently available, you may download and use Nimble for free on a 30 day renewable license. So whether you're new to OSGi, an experienced OSGi developer, or an administrator charged with deploying and managing sophisticated OSGi based composite applications, we suspect you'll find Paremus Nimble invaluable. “very impressive http://bit.ly/7lzv3w Nimble by paremus #osgi #in” by @yanpujante. Please feel free to feedback experiences and comments to the Nimble Blog, or tweet us @paremus. 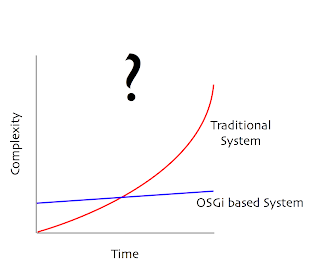 In a recent blog Hal Hildebrand argues OSGi's value proposition in terms of its ability to reduce long term 'complexity'. Hal argues that whilst it may be harder to start with OSGi as it initially appears more complex, for large applications and large teams it is ultimately simpler because the architecture is 'modular'. A diagram along the lines of the following is used to emphasis the point. As an ex-Physicists, I'm naturally interested in concepts such as 'Complexity', 'Information' and 'Entropy'; and while I agree with Hal's sentiments, I feel uneasy when the 'complexity' word is used within such broad brush general arguments. Indeed; I find myself asking, in what way is a modular system 'simpler'? Surely a modular system exposes previously hidden internal structure, and while this is 'necessary complexity' (i.e information describing the dependencies in the composite system), the system is never-the-less visibly more complex! For those interested, the following discussion between physicists at a Perimeter Institute seminar concerning 'information' is amusing, illuminating and demonstrates just how difficult such concepts can be. Before attempting to phrase my response, I visited Kirk Knoernschild's blog - IMO one of the industries leading experts in modularisation - to see what he had to say on the subject. "As we refactor a coarse-grained and heavyweight module to something finer-grained and lighter weight, we’re faced with a set of tradeoffs. In addition to increased reusability, our understanding of the system architecture increases! We have the ability to visualize subsytems and identify the impact of change at a higher level of abstraction beyond just classes. In the example, grouping all classes into a single module may isolate change to only a single module, but understanding the impact of change is more difficult. With modules, we not only can assess the impact of change among classes, but modules, as well." OSGi - Preventing 'System Rot'? The third issue is really a 'derivative' of the others: As application structure is poorly understood, accidental complexity is introduced over time as non-optimal changes are made. Hence, rather than trying to frame OSGi's value proposition arguments in terms of 'complexity' - OSGi's value is perhaps more apparent when framed in terms of 'necessary information' required to manage and change systems over time? Structural information loss over time for modular and non-modular System. Effectively dealing with both module and context dependencies is key to realizing OSGi's true value in the enterprise. "Unfortunately, if modules become too lightweight and fine-grained we’re faced with the dilemma of an explosion in module and context dependencies. Modules depend on other modules and require extensive configuration to deal with context dependencies! Overall, as the number of dependencies increase, modules become more complex and difficult to use, leading us to the corollary we presented in Reuse: Is the Dream Dead:"
However, Kirk's comment with respect to 'context dependencies' remain mostly unheard. Use of an opaque deployment artifact: Dependency resolution is again 'frozen in' at development time. Here the application is 'assembled' at development time and released as a static opaque blob into the production environment. Operations interact with this release artifact, much like today's legacy applications. While the dependencies are masked, as the unit of deployment is the whole application, this decreases flexibility, and if one considers the 'Re-use Release Equivalence Principle' partly negates OSGi's value proposition with respect to code re-use. Both of these approaches fail with respect to Kirk's 'context dependencies'. As dependencies are 'frozen in' at development time there is no ability to manage 'context' dependencies at runtime. Should conditions in the runtime environment for whatever reason require a structural change; a complete manual re-release process must be triggered. With these approaches, operational day to day management will at best remain painful. The runtime environment - a 'Service Fabric' - is model driven. Operations release and interact with a running Service via its model representation; this an SCA description of the System. Amongst other advantages, this shields the operations staff from unnecessary structural information. The release artifacts are OSGi bundles and SCA System descriptions - conforming with the 're-use / release equivalence principle'. The short answer really is - "it depends on how you use it"! Without a doubt, many will naively engage with OSGi, and will unwittingly increase operational management complexity beyond any benefits achieved by application modularization; see 'OSGi here, there and everywhere'. However, for those that implement solutions that maximize flexibility and code-reuse, while minimizing management, OSGi's value proposition is substantial; and the runtime used is a critical factor in realising these benefits. were estimated. The final figure suggested a year on year OPEX saving of 60% per application. Somewhat surprised at the size of the estimate I've challenge the group on several occasions, each time the response was that the estimates were conservative. To turn this into some real numbers - consider the following. A tier 1 investment bank may have as many as ~1000 applications; each application typically costing $1m per annum. Lets assume that only 30% of the applications are suitable for migrating to the new world - we're still looking at a year on year saving of $200m. Migration costs are not included in this, but these are short term expenses. Likewise neither are the cost savings realized by replacing legacy JEE Application Server and middleware with the Service Fabric solution. As always - 'mileage may vary' - but never the less, quite a value proposition for OSGi! "Cloud centric composite applications promise to be more disruptive and more rewarding than either the move to client-server architectures in the early 1990’s, or web-services in the late 1990’s. A successful Private Cloud / Platform as a Service (PaaS) solution will provide the robust and agile foundations for an organization’s next generation of IT services. programming language or middleware messaging product." Cloud Computing - finally, FINALLY, someone gets it! I've been really busy these last few months. So not had the time or inclination to post. Yet after reading Simon Crosby's recent article Whither the Venerable OS? I felt compelled to put pen to paper - or rather should that be fingers to keyboard. Whilst a good read, the magic paragraph for me appears towards the end of Crosby's article. "If IaaS clouds are the new server vendors, then the OS meets the server when the user runs an app in the cloud. That radically changes the business model for the OS vendor. But is the OS then simply a runtime for an application? The OS vendors would rightly quibble with that. The OS is today the locus of innovation in applications, and its rich primitives for the development and support of multi-tiered apps that span multiple servers on virtualized infrastructure is an indication of the future of the OS itself: Just as the abstraction of hardware has extended over multiple servers, so will the abstraction of the application support and runtime layers. Unlike my friends at VMware who view virtualization as the "New OS" I view the New OS as the trend toward an app isolation abstraction that is independent of hardware: the emergence of Platform as a Service." 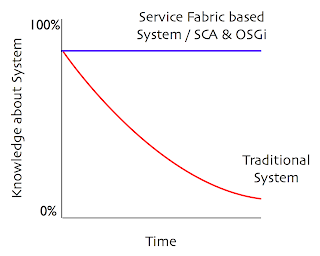 This is IMO exactly right, and the motivation behind the Paremus Service Fabric; a path we started down in 2004! Anyway, related commentary on the internet suggests that Simon's article validates VMwares acquisition of SpringSource. Well, I'd actually argue quite the opposite. Normal operating systems have been designed to run upon a fixed, unchanging resource landscapes; in contrast a "Cloud" operating system must be able to adapt, and must allow hosted applications to adjust, to a continuously churning set of IaaS resources. Quite simply, SpringSource do not have these capabilities in any shape or form. However, I would disagree with the last point in Simon's article. Having reviewed Microsoft's Azure architecture, it seems to me no different from the plethora of Cloud/distributed ISV solutions. Microsoft's Azure platform has a management/provisioning framework that fundamentally appears to be based on a Paxos like consensus algorithm; this no different from a variety of ISV's that are using Apache Zookeeper as a registry / repository: All connection oriented architectures, all suffering with the same old problems! Whilst such solutions are robust in a static environment, such approaches fail to account for the realities of complex system failures. Specifically, rather than isolated un-correlated failure events, failures in complex systems tend to be correlated and cascade! Cloud operating systems must address this fundamental reality and Microsoft are no further ahead than VMware or Google; indeed the race hasn't even started yet! And the best defence against cascading failure in complex systems? Well that would be dynamic re-assembly driven by 'eventual' structural and data consistency. How Nimble is your OSGi runtime? Hands up all of you managing OSGi dependencies via an editable list of bundles. Easy isn't it! It just works right!? Well actually - it 'just works' for a single application running in a small number of containers. From an enterprise perspective you are unintentionally contributing to an impending complexity meltdown; an explosion of dependency and configuration management issues. And if you are unfortunate enough to end up supporting your own composite creations, you may well end up envying the fate of Prometheus and rueing the day you learnt to code. Possible harsh? But I'm not alone voicing this concern! In his recent article "Reuse: Is the Dream Dead? ", Kirk Knoernschild continues his efforts to educate the industry on the tensions between code 're-use' and 'simplicity of use'. Kirk argues that as you increase potential re-use via lightweight fine-grained components, the complexity of dependencies and necessary environmental configurations corresponding increase, so making these same components harder to use. A simple concept, yet if unaddressed, an issue that will make your life as an enterprise developer increasing uncomfortable and help edge OSGi closer to that seemingly inevitable 'trough of disillusionment'. Whilst initially found wanting, a number of projects now exist to address this; including the SIGIL eclipse plug-in which Paremus recently contributed to the Apache Felix project, (SIGIL leveraging Peter Krien's BND tool). * Will aspects of the runtime environment affect the runtime dependencies within the application? * Will applications be isolated from each other, or might they run within the same JVM? * How are the released artifacts subsequently managed in the production environment with respect to ongoing bundle dependency and version management? Echoing Kirk's concerns, Robert Dunne started his presentation at OSGi DevCon Europe with the observation that; 'whilst modularity was good, its benefits are often undermined by dependency and configuration complexity'. The subject of Robert's presentation? The Paremus Nimble Resolver, which is our response to the concerns posed by Kirk. * The root component of the artifact. * And a set of associated policies and constraints. Presented with the 'root', Nimble dynamical constructs the target composite; ensuring that the structural dependencies are resolved in a manner consistent with both organizational policies and the runtime environment within which it finds itself. * Import version range narrowing. * The ability to resolve dependencies on extender bundles (DS, 'classic' Spring, Spring DM, iPOJO). * The configuration of selected extensions. * Flexible constraint requirement -> capability matching. * The ability to configure optional dependency resolution behaviors. A Nimble enable runtime quite literally dynamically assembles all required runtime application and infrastructure service dependencies around the deployed business components! Specify a WAR artifact and Nimble will instantiate the appropriate Servlet engine dictated by runtime policy attached to the WAR; i.e. Tomcat or Jetty Sir? Specify a 'Configuration', and Nimble responds by installing the target of the configuration, and of-course its dependencies. Nimble not only directly addresses Kirk's concerns, but goes on to radically transforms our understanding of the responsibilities and capabilities of next generation composite aware Service Platforms. But most importantly, Nimble was created to enable effect re-use whilst making life simpler for you and the organizations you work for. When did we (Paremus) first announce distributed OSGi again? Answer, not 2009 as one believe if you listened to all the IT vendor noise about RFC119 - but in December 16th 2005. This morning I was alerted to a blog concerning Jini and OSGi which I dually half-read, then responded. Then realized that the blogger had actually reference a short 5 minute talk I gave at the Brussels JCM 10 Jini event September 2006. As the message from this presentation had been ignored by the community since that point - I has somewhat surprised / pleased to see it referenced. The interesting thing was - at least to my mind - one of Jim's most profound comments seemed to be missed by most. This struck particular resonance with the Paremus engineering team - as our dynamic target state provisioning sub-system for Infiniflow had been released earlier that very year. This leveraging those very ideas! Conclusions? Nothing profound. Perhaps the slow pace of the IT industry? But isn't the Internet a great communal memory! Kepler - NASA's Search for Earth like Planets!